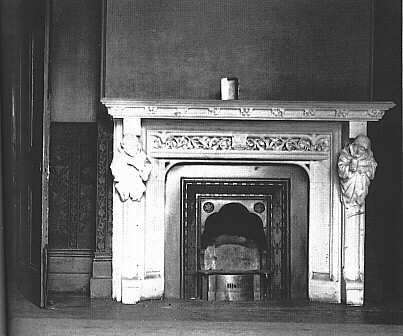 Another view of the Dining Room fireplace (Reproduced from The Enigma of Borley Rectory by Ivan Banks [Foulsham, 1996]) Both these photographs were taken by Sidney H. Glanville during his initial visits to the Rectory in June 1937. 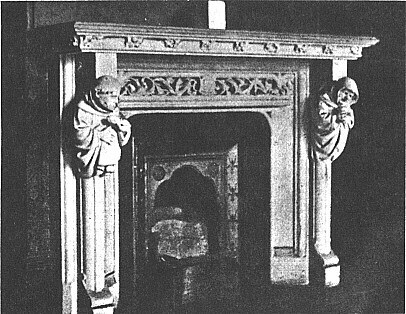 This fireplace together with the fireplace in the Drawing room was made of marble & according to Price in his first Borley book originally came from Italy & were at one time on show at the 1851 Great Exhibition in London. The tin on the mantlepiece in both photographs is a control object. An attempt to salvage the fireplace was made when the Rectory building was being demolished subsequent to the 1939 fire but it was found smashed to pieces after having been removed & set aside for the purpose.